Elderflower is Angry Orchard’s summer seasonal, and it’s pretty much exactly what you might imagine — cider that tastes like it’s been spiked with St. Germain (or other elderflower liqueur of your choice). I have no idea how much either this cider or St. Germain tastes like actual elderflower, but on the other hand, I’m guessing neither do most other drinkers, so we’re all in this together. It’s fruity but more like mild citrus and pear than apples, flowery but not oppressively so, and even a little medicinal. It’s a complex flavor that lends itself as well to a cider as it does to any number of cocktails in the form of liqueur. I drink a fair amount of Angry Orchard cider; having tried most of their catalog at this point, this is hands down my favorite. Like their other varieties, it’s quite sweet, but most of the apple flavor vanishes behind the elderflower, which really lightens it up and makes it much more interesting. 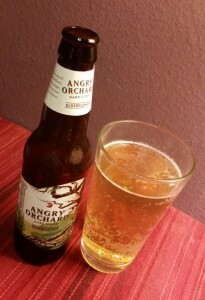 Angry Orchard is a pale straw color with an almost peachy undertone. It has a light but persistent floral aroma and an ABV of 5%. It’s only around April through August, so if you want to track some down, make sure you do it soon or you’ll be SOL till next spring. I’ve only found it in 12oz bottles, either in six-packs or included in the 12-bottle variety pack boxes. This entry was posted in Cider and tagged angry orchard, elderflower, seasonal. Bookmark the permalink. Squeeee! There I was, standing in the beverage cooler of my local grocery store, trying to figure out what cider to get. And then I saw it! It has the “seasonal” tag on the carton still ? again ? but apparently we don’t need to wait until spring to get it. Thanks, BRR! Definitely looking forward to trying this one. Glad you found some, let me know what you think! I like it. It’s light, refreshing, not too sweet, with just a hint of “is that Elderflower? !” flavor. I’m hoping to snag more when I go back for this week’s groceries.